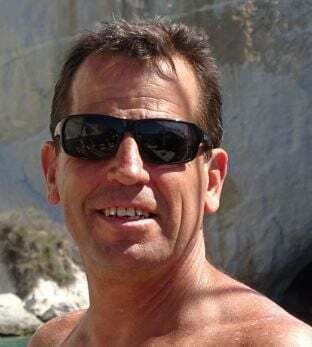 Shawn Blakeley, or “ShawnBoy” as his friends and family affectionately called him, passed away last week at the age of 50. He was a long-time resident of Calistoga, most recently residing in Santa Rosa. He attended Calistoga High School, graduating in 1987. Although his time here was too short, Shawn led an interesting and adventurous life. He worked as a contractor and equipment operator. He had a love of travel, and spent time the last few years exploring the world with his best friend Stephanie. Shawn’s great love was spending time with family and friends in the Napa Valley. Shawn did not have children, however he was the Pied Piper of uncles to his nieces and nephews. Sydney, Gatlin, Jake, Molly, Ellie and most recently Georgia Rose were very important to him and he treated them as if they were his own. Shawn was known for his “million-dollar smile”. He had a lifelong passion for the outdoors. During his youth, he cherished camping and rock jumping at the Calaveras Big Trees. He also enjoyed fishing with his best friend Bruce, a family friend since early childhood. Bruce and Shawn met weekly at their favorite breakfast spot, often reminiscing and planning for their next adventure. The Chicago Bears were his favorite football team, despite his brothers’ best efforts to persuade him otherwise. Shawn leaves behind his mother Trish Hanly, brothers Shannon (Kathy) Blakeley, Josh (Dana) Blakeley and his sister, Roberta (Garrett) Rease. He is pre-deceased by his father Les Blakeley and his brother Jonathan “Bubba” Blakeley. A memorial service will be held on Saturday, February 16 at 2 pm at the Tucker Farm Center in Calistoga. If you wish attend, please email patricia.hanly@sbcglobal.net. In lieu of flowers, donations may be made to either the Delancey Foundation or the Yosemite Conservancy.